February 5, 2019 at 12:57 pm EDT | by Lou Chibbaro Jr.
All five LGBT members of the Virginia General Assembly have joined their Democratic colleagues in calling for Virginia Gov. Ralph Northam (D) to resign following the disclosure on Feb. 1 of a racist photo on his personal page in the 1984 yearbook of the medical school he attended. The statewide LGBT rights group Equality Virginia and the Human Rights Campaign, the nation’s largest LGBT advocacy organization, have also joined numerous other political and civil rights groups, including the NAACP and the Congressional Black Caucus, in calling on Northam to resign. 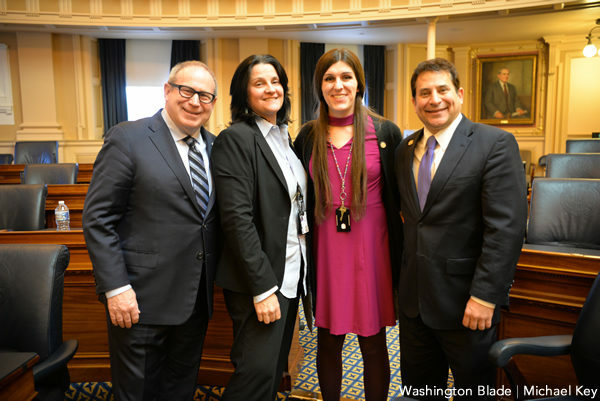 The LGBT lawmakers that joined colleagues calling for Northam to resign include Virginia State Sen. Adam Ebbin (D-Alexandria); and state House of Delegates members Mark Levine (D-Alexandria); Mark Sickles (D-Fairfax County); Danica Roem (D-Prince William County), who became the nation’s first seated transgender member of a state legislature last year; and Dawn Adams (D-Richmond), who last year became the state’s first openly lesbian member of the legislature. In yet another development that rocked the state’s capital in Richmond, the same conservative online publication that disclosed Northam’s yearbook photo reported on Sunday that a woman has accused Virginia Lt. Gov. Justin Fairfax (D) of sexually assaulting her in 2004 in a hotel room in Boston during the Democratic National Convention. Fairfax immediately denied the allegation, saying he and the woman had consensual sexual relations prior to his current marriage. He said the motive for bringing up the allegation after more than 14 years was an attempt to tarnish his reputation at a time when he might become governor. If Northam resigns, Fairfax would be next in line to become governor, making him the state’s second black governor. The allegation against Fairfax raised speculation about whether Fairfax might also be forced to resign in the #MeToo era in which women have come forward to report they were victims of sexual assault years after the alleged assaults took place. In the event that Northam and Fairfax should resign, Virginia Attorney General Mark Herring (D) would be next in line for the governor’s position. LGBT activists in Virginia say that similar to Northam, both Fairfax and Herring have strong records of support for LGBT rights. On the day his yearbook page was first disclosed last Friday by the ultra-conservative publication Big League Politics, Northam issued a statement apologizing for being in the photo. 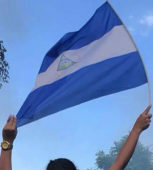 The photo showed a man in blackface and another person wearing a Ku Klux Klan robe and masked hat that covered the person’s face. Northam didn’t say which photo he was in. But the following day he stated at a nationally televised press conference that he and others who know him determined he was not in the inflammatory photo and someone who helped produce the yearbook for Eastern Virginia Medical School in Norfolk 35 years ago mistakenly placed it on his page. In yet another development that baffled observers and prompted more calls for him to resign, Northam stated at the press conference that although he was not among the two people in the yearbook photo he did cover part of his face with black shoe polish in 1984 when he appeared in a dance contest in San Antonio, Texas, impersonating singer Michael Jackson. He said he was told years later by one of his black staff members that wearing blackface of any kind is considered offensive and a racist display. He said he apologized for his action, saying he has changed in the 35 years since that time and his long career as a military and civilian doctor and public official, including his tenure as a state legislator and governor, demonstrate his strong support for civil rights for all, including blacks and the LGBT community. The LGBT lawmakers and nearly all of their colleagues who have urged Northam to resign have yet to disclose their position on the sexual assault allegation against Fairfax. When asked by the Washington Blade about the Fairfax situation, members of the Stein Club on Monday said they did not believe there was sufficient evidence associated with the allegation to take any action against Fairfax. The club members calling for Northam’s resignation said they would be pleased if Fairfax becomes governor. Virginia LGBT rights advocate Nick Benton, editor and publisher of the Falls Church News-Press, is a longtime observer of Virginia politics. He told the Blade on Monday that Democratic Party leaders throughout the state view the revelations about the racist photo on Northam’s yearbook page as potentially damaging to their effort to help their party win control of the Virginia Legislature in the state’s November elections. Benton said Democratic leaders believe anything that could create a roadblock from that happening must be stopped at all costs and their means of stopping that is to pressure Northam to resign. Yet Benton said he has found that many “rank and file” Democrats in Northern Virginia and other parts of the state are not as committed to Northam’s resignation as are the party leaders. Roem, the trans State Delegate, is among those who say Northam’s yearbook photo and his contradictory statements about whether he was in the photo, have made it impossible for him to regain his credibility as a leader of the state. “I stand in solidarity with the @VaBlackCaucus in calling for the resignation of the governor of Virginia,” Roem said in a statement. “Who I know him to be today is not reflective of his racist past but the wound ripped open today by that racism has irreparably harmed our commonwealth and hurt our people,” she said. In a three-page statement, gay Delegate Levine said while he too doesn’t believe Northam is a racist now he said his actions in the past and his statements during the past week have eroded his credibility. 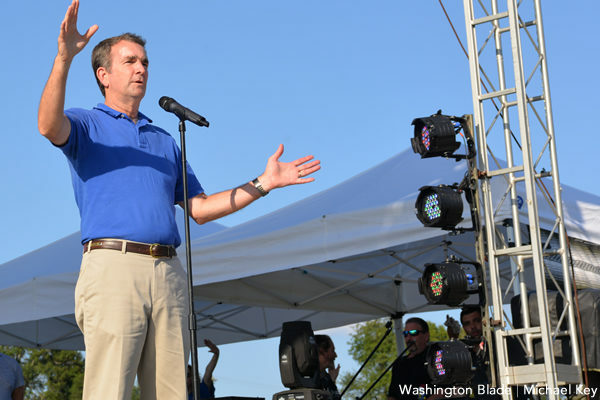 “Having said he was in the photo on Friday, I was stunned when Governor Northam denied being in the photo on Saturday,” Levine said. “He admitted to having donned black face to play Michael Jackson in a dance contest but insisted that he had never worn blackface at any other time and had never worn a KKK robe either,” said Levine. Northam told the news conference on Saturday, Feb. 2, that he had never seen the controversial photo until it appeared in the press the day before because he had never purchased his medical school yearbook. He said he initially issued the apology and acknowledgement that he was one of the two people in the photo in a rush to apologize and affirm that his values are not reflected by what he called a racist and “disgusting” photo that somehow landed on his yearbook page. On Saturday, Feb. 2, Northam told the news conference after reflecting on the matter he determined he had no memory of ever having posed for the photo and absolutely believes he isn’t in the photo. He said he had no immediate plans to resign but said he would reconsider that position if he determines he could no longer be effective as the state’s leader.